Readers will doubtless know that the ‘Maiden City’s’ ramparts form the most complete surviving urban bastioned enceinte in Ireland or Britain. Moreover, the guns poking from the ramparts are the ‘largest known assemblage’ of early artillery pieces. A team of experts from disparate disciplines have written about every aspect of these guns. Chapter 1 describes the ravages of damp and neglect, and documents the restoration work and the building of historically plausible carriages. Chapter 4 explores the origins and construction of the guns and their original carriages, while chapter 9 uncovers as much as can be found out about the Johnson and Brown dynasties responsible for founding most of them. Chapters 5–7 reveal the provenance of the guns. ‘Roaring Meg’ (‘C6’), for instance, was a demi-culverin. Such a piece typically weighed up to 3,600lbs but fired, relative to the gun’s weight, a relatively puny shot of 9–12lbs. It (or she) was one of fifteen guns (seven survive) sent by the London Companies to Derry in 1642 to bolster the city’s defences after the outbreak of native insurgency in October 1641. Barrel stripped, cleaned, buffed, coated with preservative, packed with polystyrene foam almost to the muzzle and mounted on a new carriage, ‘Roaring Meg’ looks set to last another few centuries. Her provenance is fairly straightforward, but in the many cases where documentary evidence is wanting it is necessary to rely on maker’s marks or on more subtle features: how flared is the muzzle, how lipped the ‘cascable’ (the rounded bit at the breech or back end of a gun) and so on. The metallurgical analysis of chapter 8 has oddly beautiful photographs of graphites, carbo-nitrates and suchlike, with boldly coloured striations and blotches. Chapter 2 gives the historical context of Derry’s guns. Artillery and artillery-resistant fortifications had arrived in the north-west before newcomers stuck the ‘London’ onto ‘Derry’. For instance, O’Doherty’s Burt Castle had a ‘thick rampier’ (rampart) and bristled with five guns that must have come from Spanish Armada wrecks. It also explains the technical and material challenges of cannon-founding and powder-milling. The use of graveyard soil as a source of nitrates for saltpetre—the biggest and most problematic ingredient—was not unusual. 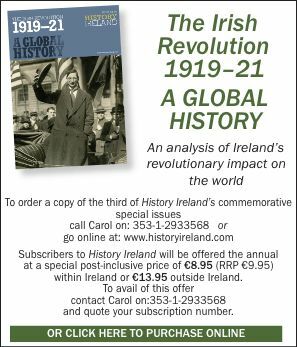 That the Irish insurgents used human remains, still with ‘some bones and flesh about them’ (p. 41), was, however, somewhat ghoulish. It also emphasises that there was ‘an exceedingly low’ level of gun-founding in Ireland before 1641 (p. 31), exclusively confined to the settler community, specifically to Richard Boyle’s works at Cappoquin, Co. Waterford, and Richard Blacknall’s at Ballinakill, Co. Laois. Confederate Catholic armies suffered a relative disadvantage through relying on external sources for guns, small arms and larger quantities of gunpowder. Readers are also reminded that gunnery could be, literally, a hit and miss business. At the battle of Liscarrol in 1642, Munster Protestants and Confederates exchanged up to 30 shots with only one hit, which killed five Irishmen, probably knocking over a whole file of foot soldiers. 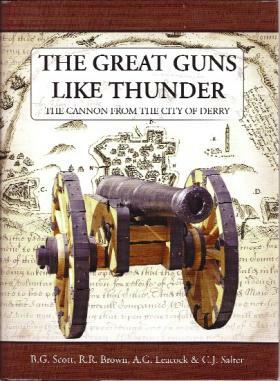 Put to the test, Derry’s gunnery proved quite impressive in 1689, as evidenced in chapter 3. Given that its defences were ‘designed with the specific purposes of mounting artillery and providing a defence against it’ (p. 63), this chapter on the city defences is a key section of the book. For defensive purposes Derry was virtually an island, a hill within a loop of the Foyle falling to the wetter contours of today’s ‘Bogside’ on the landward side. Pynnar’s (1619) and Raven’s (1622) maps (the quality of maps and illustrations is superb) show a small but sturdy city encompassing the biggest two of Docwra’s works, those at the O’Doherty tower-house at Shipquay (reconstructed as the Tower Museum) and the biggest earthworks towards the crown of the hill. The main square or ‘diamond’ formed the centre of a cruciform defined by four roads radiating to the four gates. The author laments the absence of any documents explaining the design of Derry’s defences and tries to fill the gap by explaining the rationale underlying new artillery fortifications in general: thick artillery-resistant ramparts created blind spots that could only be properly engaged by angular bastions. The explanation is succinct and accurate (pp 64–5) but not enough. Comparisons could readily be made with other towns. Bandon’s walls (County Cork) date from the same period. Comparisons with the other and slightly bigger company town of Coleraine might also have been illuminating. As Paul Kerrigan shows in the traces reproduced in his Castles and fortifications in Ireland (Cork, 1995), the cruciform street pattern is similar and the ramparts of both Derry and Coleraine are endowed with rather broad and obtuse angled bastions. But the sheer bulk of Derry’s ‘verie strong’ (p. 21) ramparts remains incomparable. Pádraig Lenihan lectures in history at the University of Limerick.